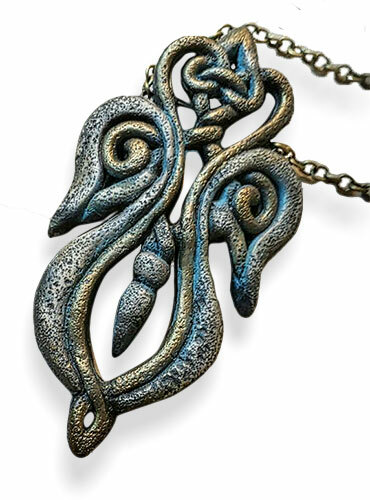 Yes, these neck pieces are polymer with an dramatic ethnic twist from Sona Grigoryan. Sona, now living in Barcelona, leans heavily on her Armenian heritage for those dark, meandering patterns that vine around necks and arms. Her patterns weave in and out and she finishes them with dark metallic-like finishes. Though her construction looks delicate, she engineers the pieces to sit comfortably and sturdily. See all her works on Facebook, Pinterest (see her stash of Armenian designs) and Flickr. I find all of Sona’s work simply mind-boggling! Beautiful work! And, thank you, Sona, for the tutorials on your site! Very generous of you!